This tour departs at 12 pm every day. Skip the line guided tour of St Mark's Basilica is available any day. We are comparing St. Mark's Basilica Skip the Line Tour Prices from leading ticket suppliers and Try to find you Cheap tickets prices on the market. Named after the patron saint of the city, San Marco Basilica is among the grandest of Roman Catholic Cathedrals. It first became a church in 828 but this landmark has faced its share of hardships and reconstructions works have taken place many times to restore the cathedral. The Basilica you see today was build in the 9th century and is a fine example of Byzantine architecture. St Mark's Cathedral also has some unique quirks. Built in the lowest area of a city which is constantly moving, you may notice the effect of the lagoon, making waves in the marble flooring. Looking up you'll find a sky of 24-carat gold leaf and gems, covering approximately 8500 m2 with glistening mosaics. For more evidence of the Venetian's wealth, your guide will show you the Pala D'Oro. You will meet your English speaking guide on Piazza San Marco and, after introductions, begin your 1-hour walking tour. Let your local guide fill you in on the history of St Mark's Basilica, hear the legend of how St Mark's body travelled from Egypt and came to rest inside this very Basilica. 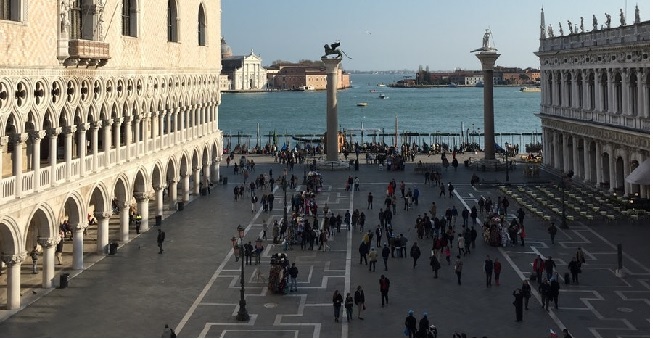 After the tour you will be free to walk around the cathedral independently, climb to the terraces (not included) or grab an espresso on Piazza San Marco. San Marco Basilica is one of the most visited Venice attractions and a must for anyone coming to the city. The skip the line ticket will be particularly useful for people with limited time in Venice of for people visiting with children or seniors. Your Experience With St. Mark's Basilica Skip the Line Tour? Visit one of the most significant Catholic Cathedrals in the whole of Europe, St Mark's Basilica. Sail past long entrance queues with a skip the line priority entrance ticket. Admire Byzantine and Roman art pieces as well as brilliant mosaics of gold and precious stones. Visit the Pala D'Oro inside St Mark's Cathedral. Learn the history and significance of this Roman Catholic Cathedral from a qualified, multilingual guide. What St. Mark's Basilica Skip the Line Tour Includes? Skip the Line entrance ticket to St Mark's Basilica. Guided tour of St Mark's Basilica in English, Italian, Spanish, French or German. Book an early morning or late afternoon slot to avoid visiting during the busiest hours. There are very ‘glamorous' orange scarfs for visitors to borrow if you've forgotten to wear something which covers your shoulders and knees. Travelers Reviews about St. Mark's Basilica Skip the Line Tour? The skip the line guided tour has 4.5-star ratings on TripAdvisor and Viator. On the Get Your Guide website the tour has a slightly lower 4 out of 5-star rating. Comments agree that the tour is informative and well organised while the guide is very knowledgeable. Certain customers have pointed out that the tour makes many references to bible stories, but most comments agree that the tour content is balanced. Most tour providers require at least 3 - 7 days cancellation notice, cancellation fees may occur. Please bring your ticket in print or electronic form. All visitors must have knees and shoulders covered to enter the St Mark's Basilica. Bags must be left outside in safety deposit area. Food, drinks, tips and the upper level of the Basilica are not included in ticket price. On rare occasions St Mark's Basilica may be closed due to flooding or religious holidays. Meeting Point: Outside YEX Change Office, under the Clock Tower, Piazza San Marco.